Candy corn, you love it or you hate it, right!?! 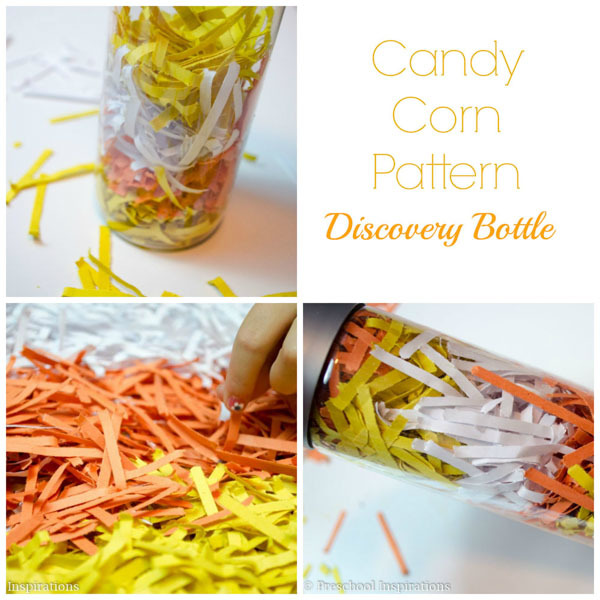 I think the colors on the candy corn are perfect together, which is the inspiration for today’s sensory bottle — a candy corn pattern discovery bottle. Truthfully, I’m not a huge fan of the candy, but I always have to eat a few. And when I do, I bite each color off. One at a time! Am I just crazy, or does anyone else do that too? 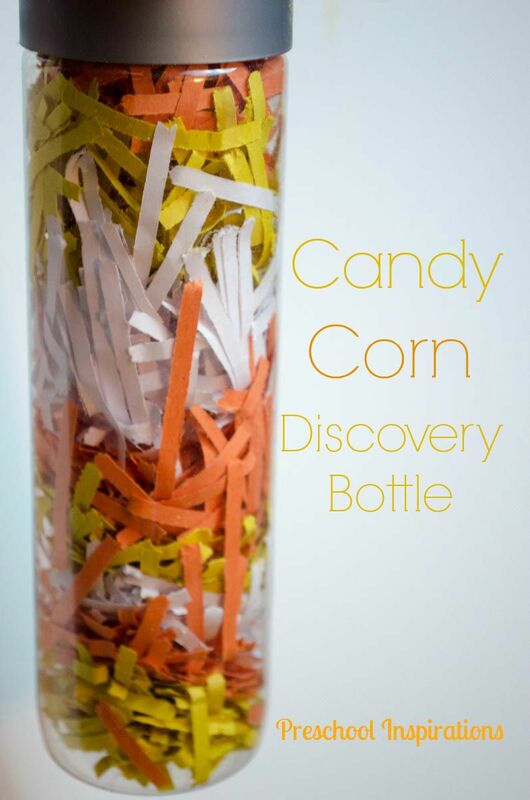 This discovery bottle is the most affordable one I ever made! It was probably 30 cents worth (not including the bottle though). Plus, at the end of this post is a bonus — four more awesome discovery bottles since this is a Discovery Bottles Blog Hop! We used paper from my “scrap paper bin.” Do you have one of those too? I feel like it gets fuller and fuller month after month, and I keep forgetting to use it. That’s where this discovery bottle is perfect! 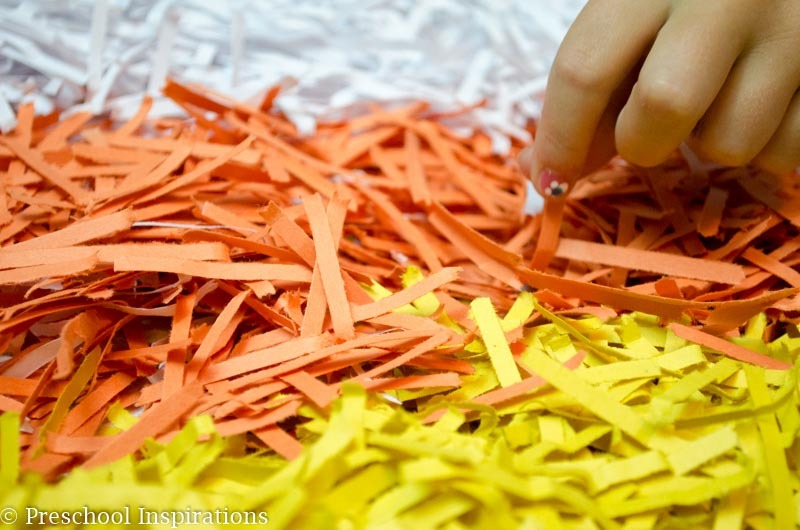 We found all the orange and yellow papers and put them in my paper shredder. Then I grabbed a couple sheets of white printer paper. How inviting is this!?! We’re making a sensory tub out of the extras actually. 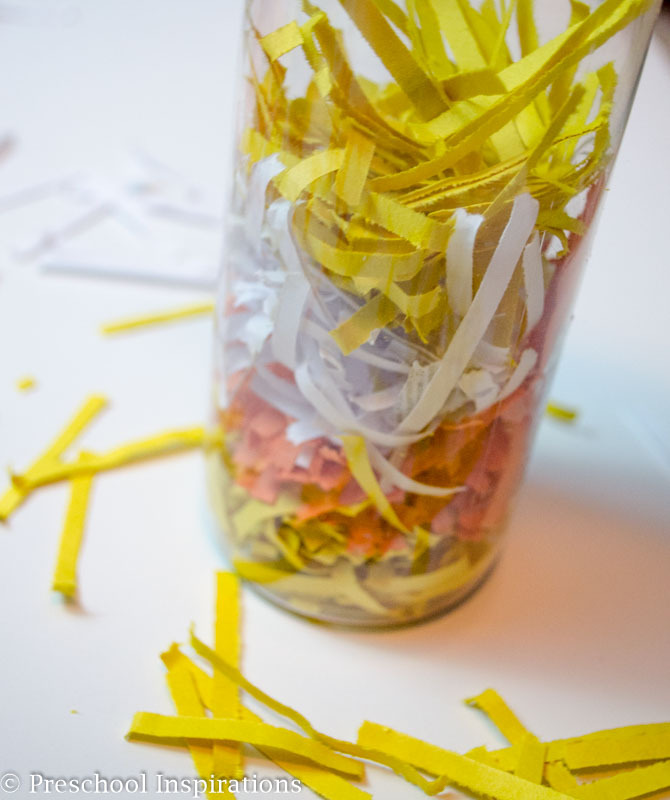 Shred the papers, one color at a time. Once you move onto the next color, you may find that some of the previous color still falls through the shredder. This is where kids rock. I say “let’s see who can find the color that doesn’t match!” My kids went to town with this and organized all our colors super quickly. Don’t you wish you could bottle that energy! Or borrow it! 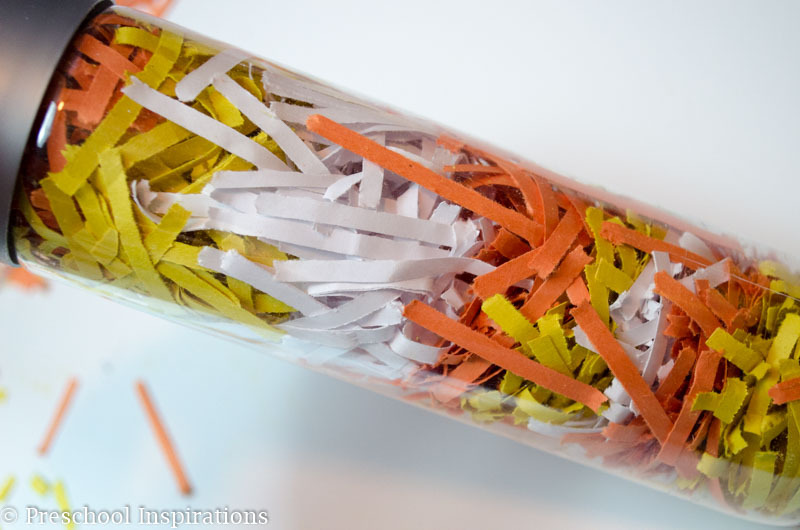 Add each color of shredded paper one at a time, and feel free to use something long and pointy to smash it down. We found a butter knife works perfectly! Just repeat until you get the perfect bottle! I am going to have to admit that I really wanted to help my kids make one that was “perfect-ish.” The colors kept mixing together, and I kept biting my lip. It’s so much better when we let them do the work, but apparently even I have trouble not intervening from time to time. Neat idea Katie! I love that you’re using recycled materials too!